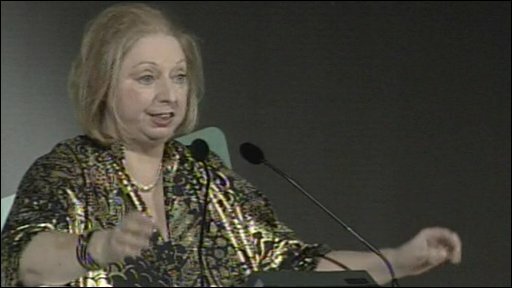 Author Hilary Mantel has been named 2009 Man Booker Prize winner for her historical novel Wolf Hall. Mantel, 57, beat five other shortlisted authors, including Sarah Waters and JM Coetzee, with her book based on Henry VIII's adviser Thomas Cromwell. Judges praised the "extraordinary story-telling" of Mantel. The author, who received the £50,000 prize at a ceremony at London's Guildhall, said it had taken her about 20 years to decide to write the book. "I couldn't begin until I felt secure enough to say to my publisher - just what a publisher always wants to hear - 'this will take me several years you know'. But they took it on the chin," she said. Mantel, who is now working on a sequel, also beat AS Byatt with the novel The Children's Book, Adam Foulds for The Quickening Maze and Simon Mawer for The Glass Room. Waters was shortlisted for her book, The Little Stranger, and Coetzee had been in the running for his fictionalised memoir, Summertime. "When I began the book I knew I had to do something very difficult, I had to interest the historians, I had to amuse the jaded palate of the critical establishment and most of all I had to capture the imagination of the general reader," Mantel said. Chairman of judges James Naughtie said: "Our decision was based on the sheer bigness of the book. The boldness of its narrative, its scene setting. "The extraordinary way that Hilary Mantel has created what one of the judges has said was a contemporary novel, a modern novel, which happens to be set in the 16th Century. "We thought it was an extraordinary piece of story-telling." Despite that, he revealed it had not been an "unanimous decision, but it was a decision with which we were all content". Mantel, who was made CBE in 2006, saw her first novel, Every Day is Mother's Day, published in 1985. Its sequel, Vacant Possession, followed a year later. In 1989 she won the Winifred Holtby Memorial Prize for Fludd, then A Place of Greater Safety scooped the Sunday Express Book Of The Year award in 1993. Three years later Mantel was presented with the Hawthornden Prize for An Experiment in Love. She was also shortlisted for the Commonwealth Writers Prize and the Orange Prize for Fiction, both in 2006, for the novel Beyond Black. Mantel had been the bookmaker's favourite to win the award. William Hill had offered odds at 10/11 - the shortest odds it has ever given a book to win the prize. Ion Trewin, literary director of the Booker Prizes, said the last time a favourite walked off with the prize was Yann Martel's Life of Pi in 2002. Naughtie was joined on the judging panel by biographer and critic Lucasta Miller; Michael Prodger, literary editor of the Sunday Telegraph; Professor John Mullan, academic, journalist and broadcaster; and Sue Perkins, comedian, journalist and broadcaster. The Man Booker Prize for Fiction, first awarded in 1969, aims to promote the finest in fiction by rewarding what its judges believe is the best book of the year. Do bookies read the Bookers?